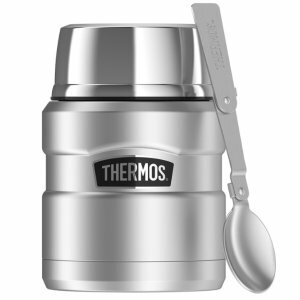 Amazon.com offers the Thermos Stainless King 16 Ounce Food Jar with Folding Spoon for $19.98. Features: Thermos vacuum insulation technology for maximum temperature retention, hot or cold, keeps liquids hot for 7 hours and cold for 9 hours. Durable stainless steel interior and exterior. Cool to the touch with hot liquids, sweat proof with cold.